Gold and silver futures ended lower for the first time in three sessions Friday, posting losses for the holiday-shortened trading week. Markets in the U.S. closed Thursday for the Thanksgiving holiday and ended early on Black Friday. Gold for December delivery shed $4.90, or 0.4%, to settle at $1,287.30 an ounce on the Comex division of the New York Mercantile Exchange. "There’s some liquidation of gold taking place, but light volume," Reuters quoted Bill O’Neill, partner at Logic Advisors in Upper Saddle River, New Jersey. "Next week will be important, because we are close to that $1,300 level and the market has the potential to break through and establish a slightly higher range," he said. Gold futures slipped 0.7% this week after gains of 1.8% last week and 0.4% the week before then. They are 11.8% higher so far this year. "A total of 19 market professionals took part in the Wall Street survey. Thirteen, or 68%, called for gold to rise. Two participants, or 11%, looked for gold to fall, while four, or 21%, said neutral or sideways. Meanwhile, 744 votes were cast in an online Main Street poll. A total of 421 voters, or 57%, looked for gold to rise in the next week. Another 229, or 31%, said lower, while 94, or 13%, were neutral." Elsewhere, silver for December delivery lost 12 cents, or 0.7%, to end at $16.992 an ounce. Silver futures fell 2.2% this week after three consecutive weekly wins pushed prices up by a combined 3.7%. They are 6.3% higher on the year to date. January platinum added $4.60, or 0.5%, to $945.30 an ounce, but logged a weekly decline of 1%. Palladium for December delivery dropped $8.25, or 0.8%, to $993.70 an ounce, but edged up about 0.1% on the week. Both are higher on the year so far with advances of 4.4% for platinum and 45.4% for palladium. Gold edged up 15 cents, or less than 0.1%, to 1,290.50 an ounce. Silver slipped 4.5 cents, or 0.3%, to $17.05 an ounce. Platinum added $2, or 0.2%, to $935 an ounce. Palladium declined $4, or 0.4%, to $1,001 an ounce. For the week in London bullion prices, gold rose 0.5%, silver and platinum each declined 0.2%, and palladium added 0.4%. Gold coins climbed by 2,000 ounces this week after rising by 4,000 ounces last week. Gold sales this week came entirely from the 1-ounce American Gold Eagle. Last week, splits included 3,500 ounces in American Gold Eagles and 500 ounces in American Gold Buffalos. 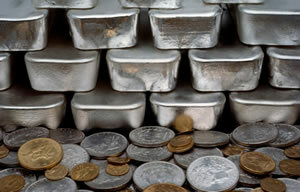 Silver coins advanced by 37,500 ounces this week after rising by 329,500 ounces last week. Splits included 30,000 ounces in American Silver Eagles versus 175,000 ounces previously and 7,500 ounces in George Rogers Clark 5 Ounce Silver Bullion Coins compared to 154,500 ounces in their debut week last week.